The Florida Keys is one of the best spots in the US to go on a road trip. In just 100 miles, hop from key to key, go snorkeling, dine at seafood restaurants, try Key Lime Pie, go shopping, and enjoy endless views of brilliant aquamarine water. It’s a gorgeous drive with lots to do. The Florida Keys Overseas Highway is 113 miles in length, joining the mainland of Florida (starting in Florida City, just south of Homestead) to Key West. If you drove directly from Key Largo to Key West, it would take you roughly 2.5 hours, traveling distance of 100 miles. There are hundreds of islands, also called “keys,” that make up the archipelago of the Florida Keys. These small islands are joined by a series of bridges. 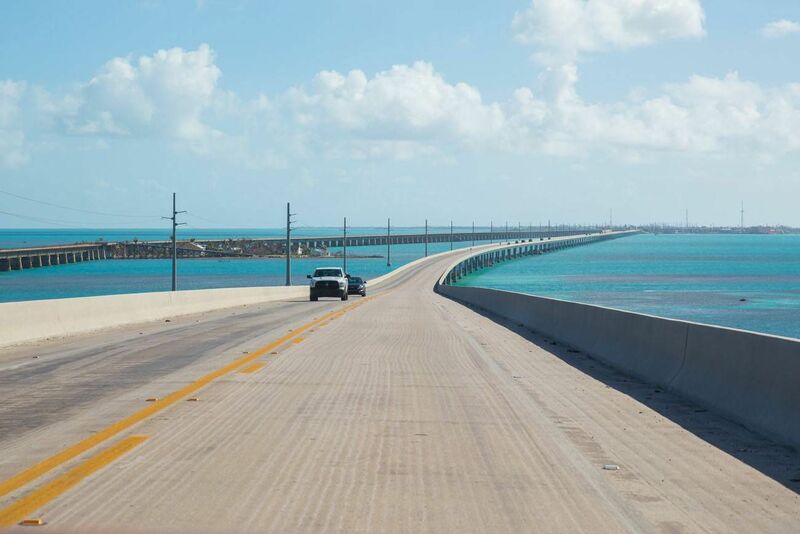 The longest bridge is Seven Mile Bridge, which joins Knights Key in the Middle Keys with Little Duck Key in the Lower Keys. Tim and I spent several days road tripping along the Florida Keys and visiting Key West. 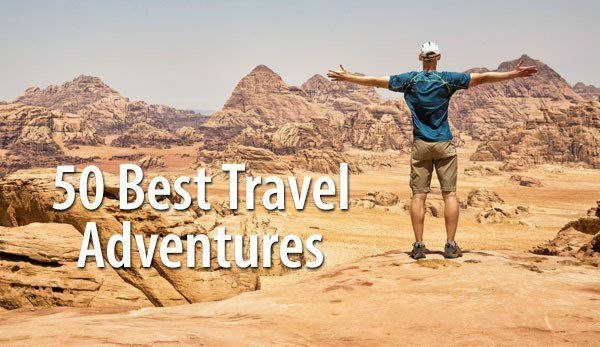 This list only includes things to do from Key Largo through Big Pine Key (one of the last major Keys before you reach Key West). 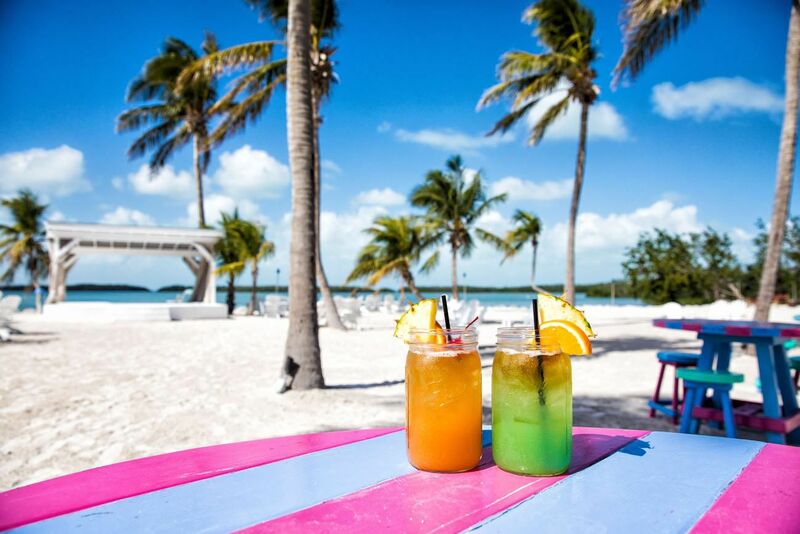 We have a separate article about the best things to do in Key West that you can read here. 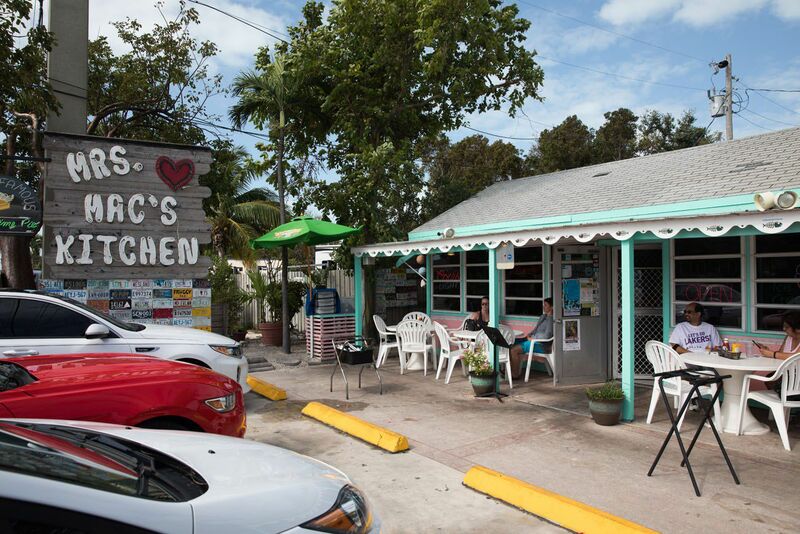 Mrs. Mac’s Kitchen is one of the most popular places to eat in Key Largo. This is a small restaurant serving brunch, lunch and dinner. 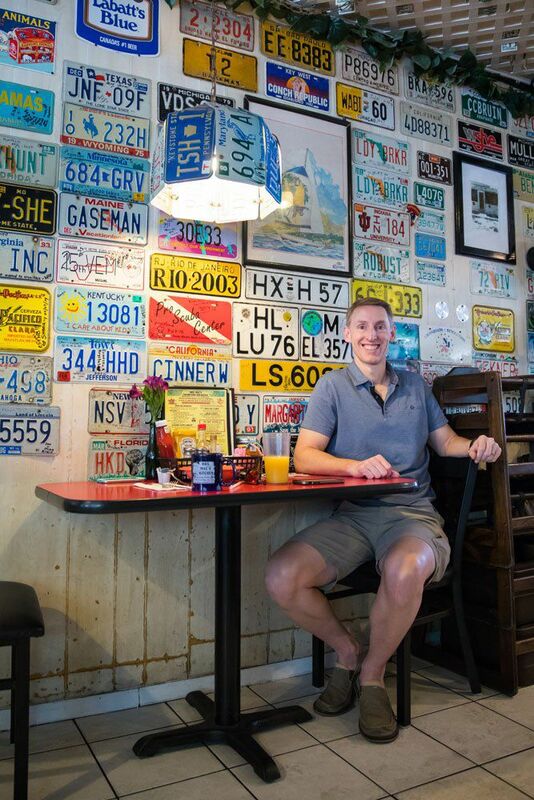 The walls are covered with license plates from the US and around the world and the ceiling is stuffed with dollar bills. This was our first stop in the Keys, arriving here in time for brunch. I had the fish and grits and Tim ate the caramel bacon waffle (yum…sweet and salty!) with a side of alligator sausage. Note: There is a second Mrs. Mac’s Kitchen (Mrs. Mac’s Kitchen II). If you want the quirky, original restaurant, visit Mrs. Mac’s Kitchen at mile post 99.3. 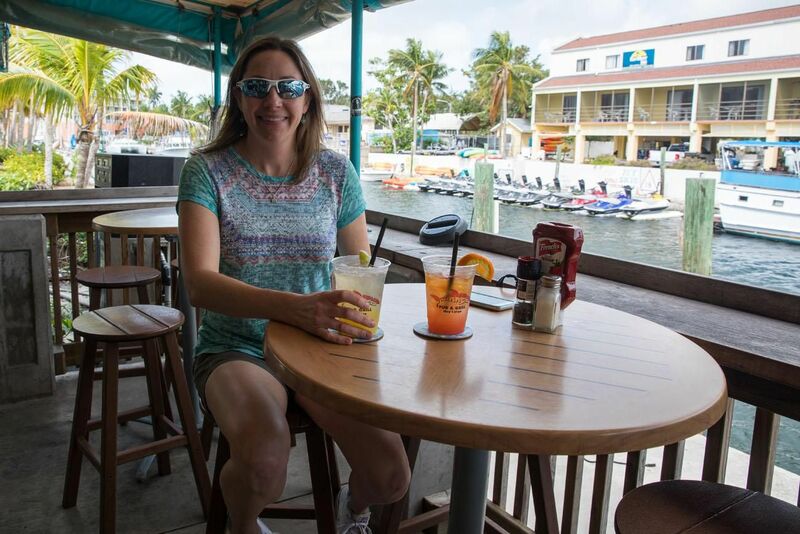 Located in the marina in Key Largo, Sharkey’s Pub serves pub food and great drinks. 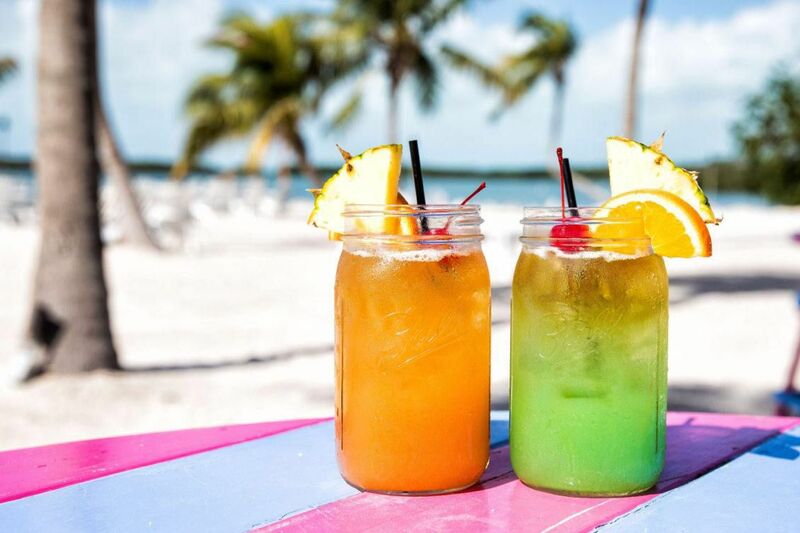 If your day is ending in Key Largo, consider ordering one of their jumbo sized rum buckets. Key Largo is world famous for its diving and snorkeling. The best place to go is the John Pennekamp Coral Reef State Park. There are numerous dive companies and snorkel companies that will take you out for a few hours or longer. We hired Keys Diver to take us on a 4-hour snorkel trip to the John Pennekamp reef. We were extremely lucky that our excursion went on schedule. Boats did not leave Key Largo for 6 consecutive days before our trip due to high winds and rough water. For our scheduled tour, we could go out on the water, but the crew was limited where to take us because of the rough conditions. 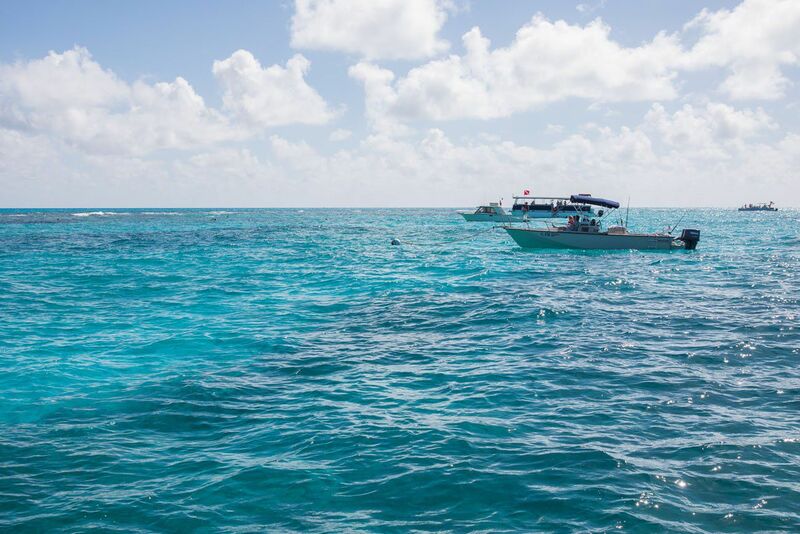 We booked this excursion because you have the opportunity to visit multiple reefs as well as a famous statue called “Christ of the Deep.” Because of the rough seas, the crew could only take us out to one snorkel spot. Tim and I had a good time, but not a great time. The snorkeling did not live up to our expectations. Either the rough waters impacted the quality of the snorkeling, or we have just done this at too many other spots around the world for Key Largo snorkeling to thrill us. We saw lots of barracuda and assorted tropical fish, but nothing “Wowed!” us. For a four hour trip, with half of that a boat ride to and from the reef, we were honestly disappointed. However, I want you to know that this was in no way any fault of Keys Diver. They were wonderful, offering a safe, fun, comfortable experience. We have no complaints about their service and highly recommend them. However, it’s the quality of the snorkeling that left Tim and I disappointed. If you have never been snorkeling before, and the waters aren’t too rough, this is still a very worthwhile experience. Keys Diver also offers shorter 2-hour snorkel trips that give you a good intro into snorkeling. For more information, visit the Keys Diver website here. There are numerous restaurants claiming to have the best Key Lime Pie in the world. 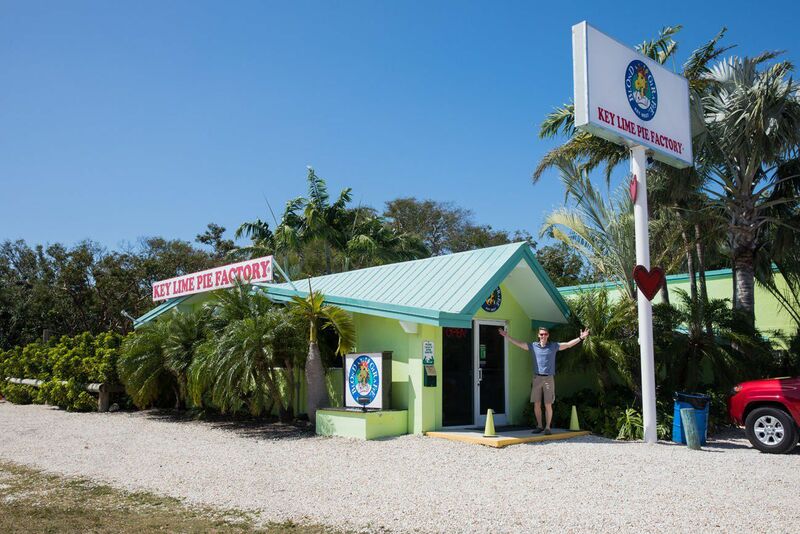 Tim and I sampled Key Lime Pie at several restaurants in the Keys (our waistlines got a bit bigger on this trip…we pretty much ate our way through the Keys and Key West) and our favorite spot is the Blond Giraffe Key Lime Factory. Buy just a slice or a whole pie to go and enjoy one of the Florida Key’s tastiest dishes. The Blond Giraffe has a wonderful outdoor seating area, with tables and Adirondack chairs in the shade of giant trees. They also serve coffee and lots of Key Lime flavored delicacies. Enjoy! 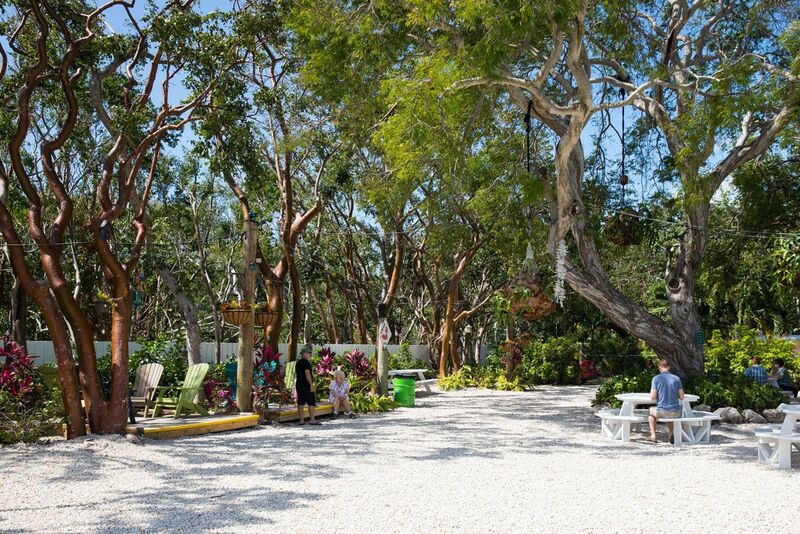 For another quirky spot in the Keys, make a quick stop at the Rain Barrel Sculpture Gallery. 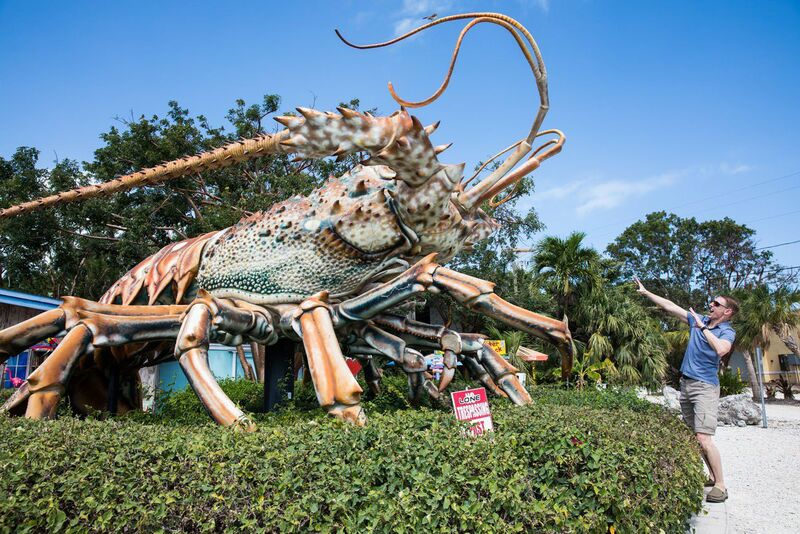 You know you are in the right spot when you see the gigantic lobster out front. This gallery is a collection of small shops selling everything from wind chimes to Tiki heads to clothing and jewelry and arts and crafts. It’s a fun place to browse, go souvenir shopping, or to simply buy something strange and unusual. 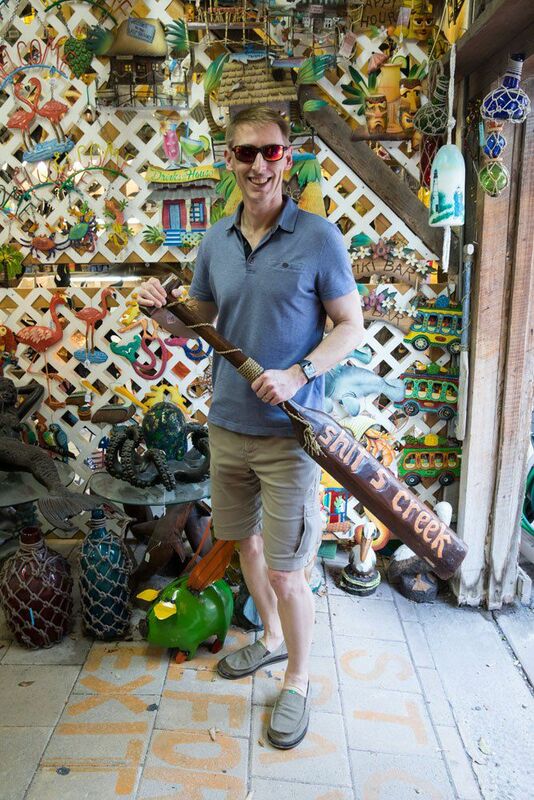 This was our favorite weird place to go shopping in the Florida Keys. If you have any interest in scuba diving, this is a cool museum to visit. Drs. 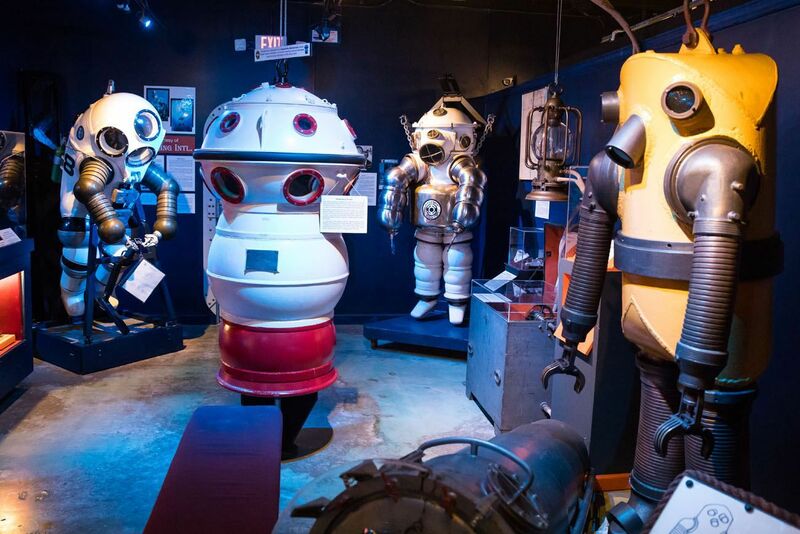 Joe and Sally Bauer have spent the last 40 years assembling the largest collection of dive helmets, scuba gear, armored suits, and diving memorabilia in the world. Immerse yourself in diving history in this very well designed and informative museum. 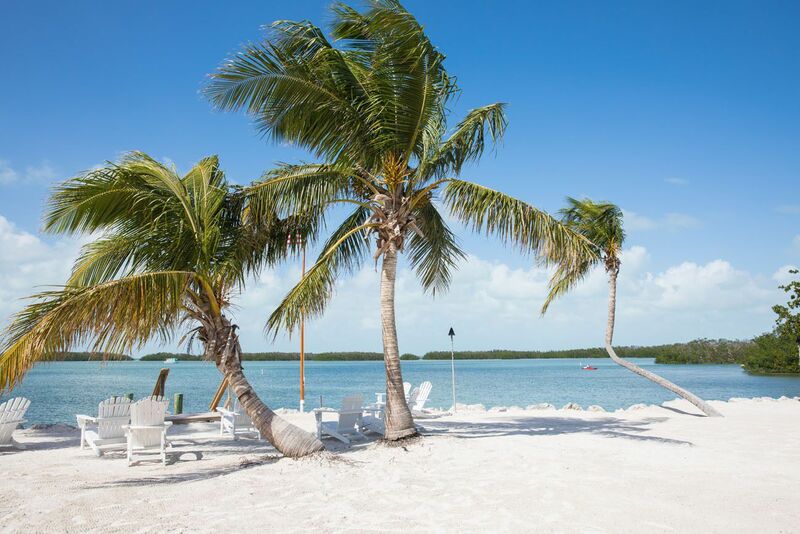 When you think of the Florida Keys, what comes to mind? 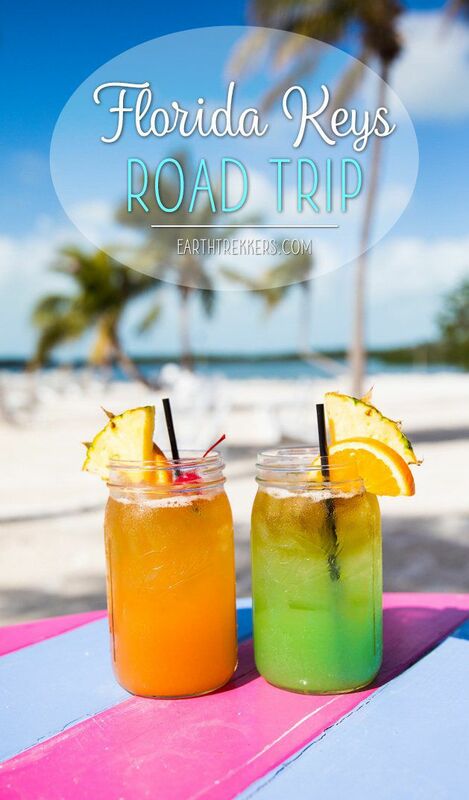 White sandy beaches, palm trees, crystal clear aquamarine water, and maybe even tropical drinks? If you are looking for those things, you can find them all at Morada Bay. Tim and I had an early afternoon snack with tropical drinks. The setting is awesome and the food is just as good. This was our favorite spot in the Florida Keys. 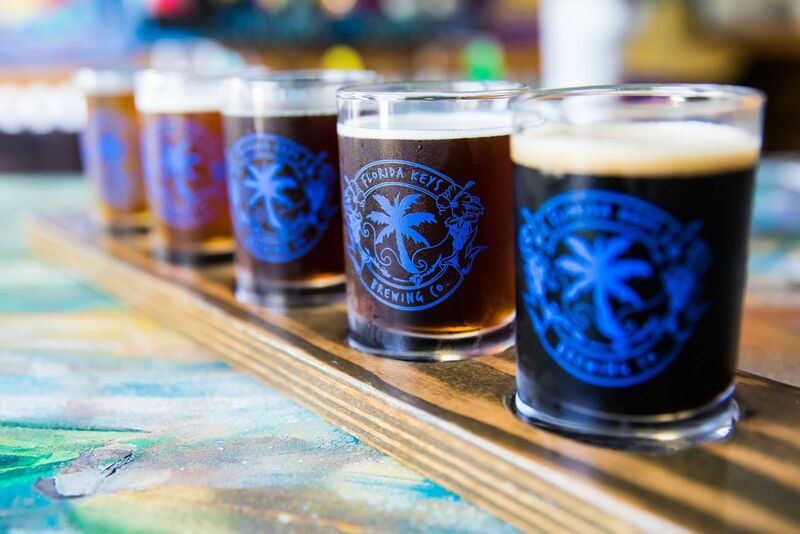 Just across Overseas Highway from Morada Bay is the Florida Keys Brewing Company. 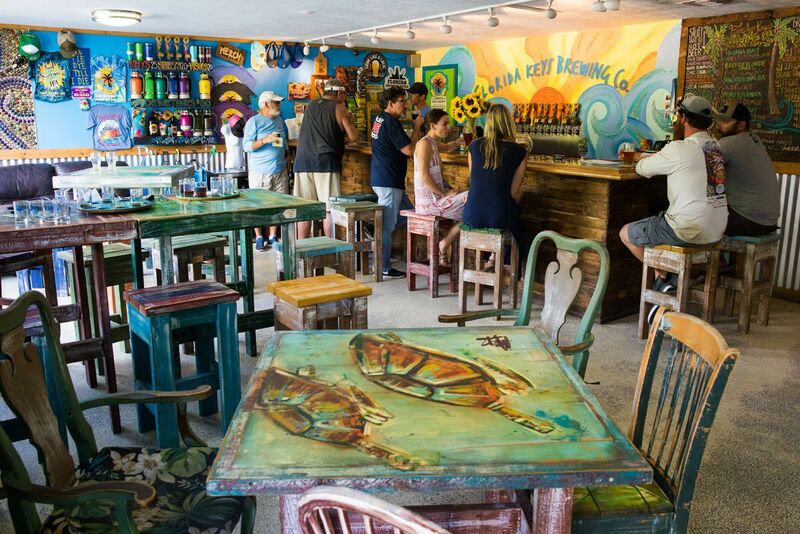 This is a great spot to sample some local beer. We ordered a flight of beer and I drank most of it (and the drinks at Morada Bay!) since Tim was our driver. 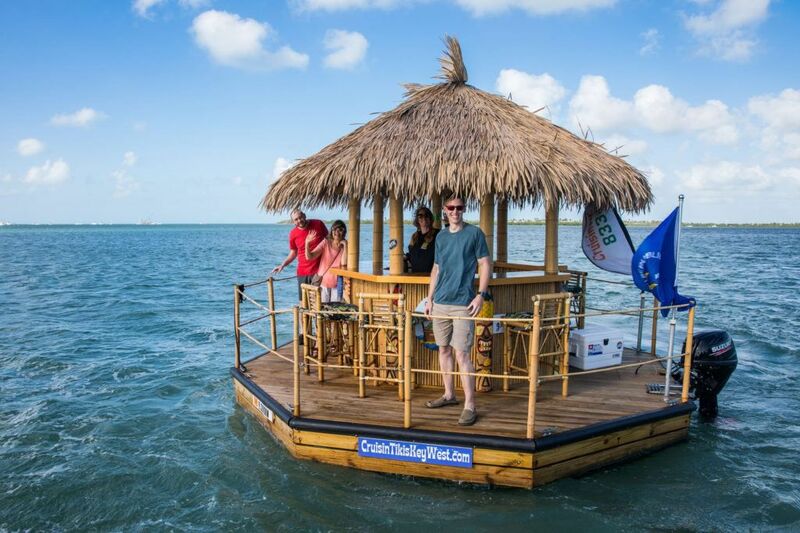 This is a must do in the Florida Keys…if you dare! A tarpon is a large fish that can grow up to 8 feet in length. At Robbie’s you can hand feed these big guys. It sounds simple…hold a small, dead fish in your hand, dangle it just above the surface of the water, and drop it into the mouth of a tarpon when it comes charging up out of the water. First of all, there are the pelicans. 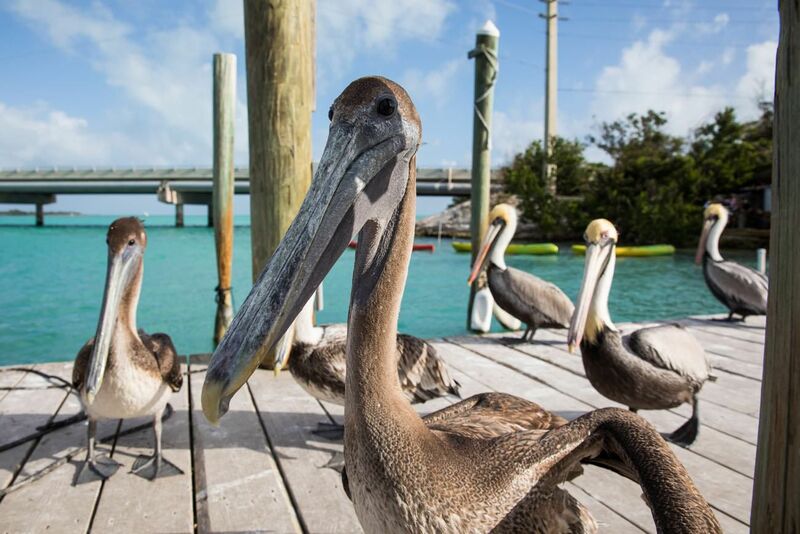 If you’re not careful, those darn pelicans will eat your bucket of fish before you get a chance to even try to feed a tarpon. The pelicans surrounded us, getting very close and even a little aggressive, trying to steal our fish. We quickly learned that if you stomp your feet and advance on them, they will fly away. I really was not trying to feed the pelicans. They just had me cornered!! 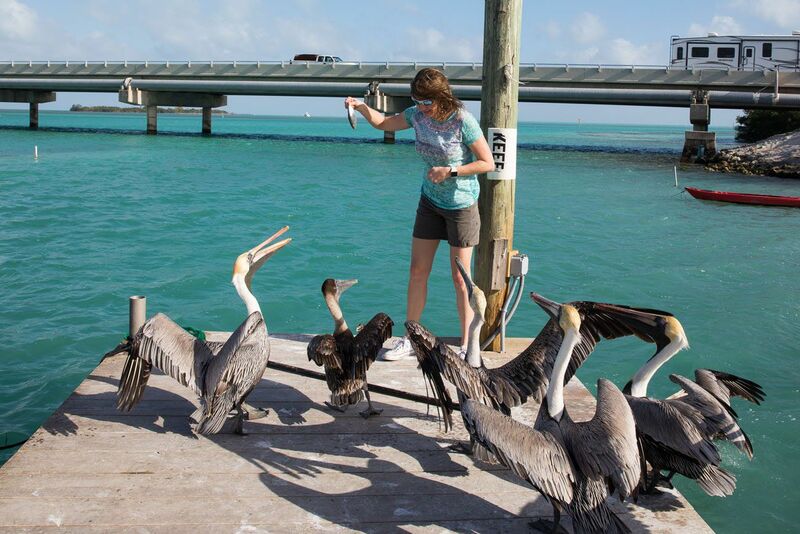 The pelicans also linger in the water and they will steal your fish out of your hand before the tarpon does. The trick is finding a spot of open water that is pelican-free. The enclosed “pool” on the deck of Robbie’s is the perfect spot for this. Now, you have your chance to feed the tarpon. Dangling your hand over the water the first time can feel a little alarming. In a blink of an eye, the tarpon rushes out of the water, snatching the fish from your hand. If you don’t let go of it quick enough, you will feel their tiny, sharp teeth. But it’s tons of fun and Tim and I loved every minute of it, even chasing away those pesky pelicans! Just as a side note, Islamorada is known as the “sport fishing capital of the world.” Robbie’s also offers numerous fishing excursions if you are interested. We didn’t do this, but I am including it because I wish we did. We just simply ran out of time. 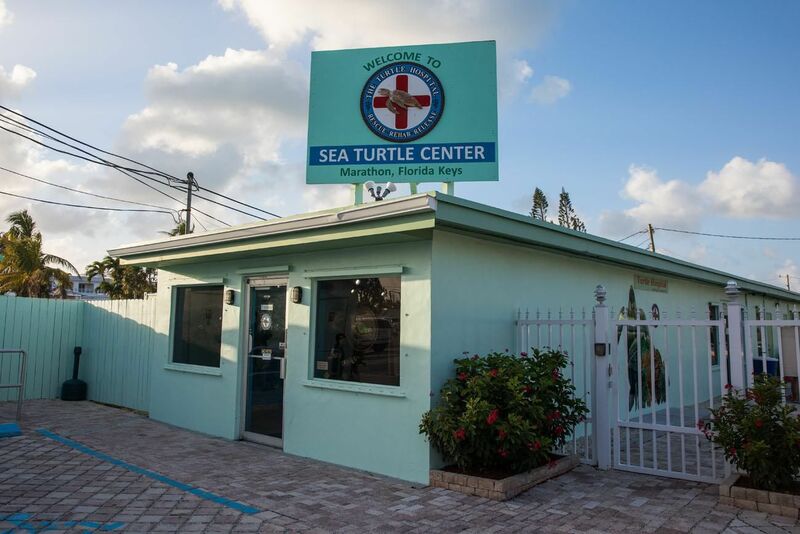 The Turtle Hospital rescues and rehabilitates sick and injured sea turtles so they can be returned to the wild. Guests can take a 90-minute tour of the hospital facilities. It sounds like a wonderful program and I am very sorry we missed it. The water in the Florida Keys is a vibrant aquamarine color. It really is beautiful to see. As you drive over this long bridge, enjoy the views of this technicolor water. As you head south you will see the old bridge to your right. This was the original railway bridge that was later converted into a road and more recently is a bridge for pedestrians and fisherman. The old bridge does not continuously span the seven miles so you cannot walk one way along this entire distance. Portions of the Old Seven Mile Bridge are currently closed for renovation. We were able to walk out onto the southern portion from Little Duck Key, although you cannot walk too far because you reach a large gap in the bridge. 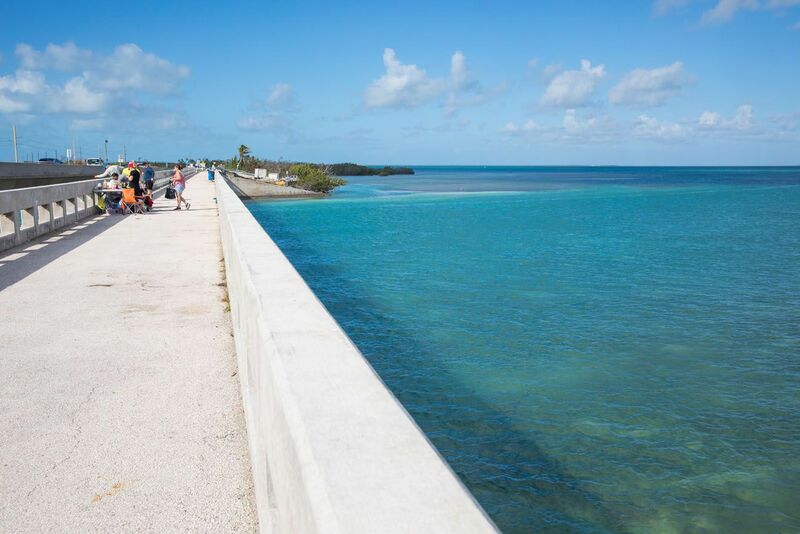 The northern section of Old Seven Mile Bridge is expected to reopen for pedestrians in 2021. Big Pine Key is a large island, at least for the Florida Keys. It was also hit hard by Hurricane Irma. In February 2018, we still saw extensive hurricane damage here, including piles of rubble, flattened buildings, and trees that are leaning and dangerously close to falling over. Key Deer call Big Pine Key home. The population of these tiny deer are endangered due to poaching and habitat destruction. Drive slowly while you are on to lower keys to avoid hitting one of these little guys with your car. Just put “No Name Pub” into Google Maps and follow the directions. 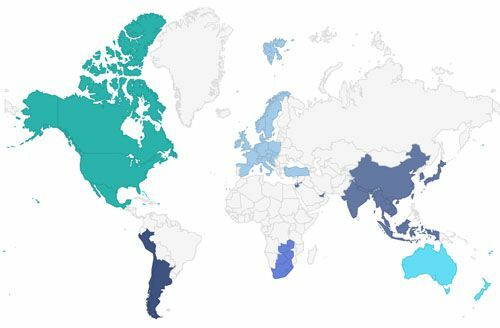 How did we ever get around before Google Maps? No Name Pub dates back to 1931 and started off as a bar and a brothel. 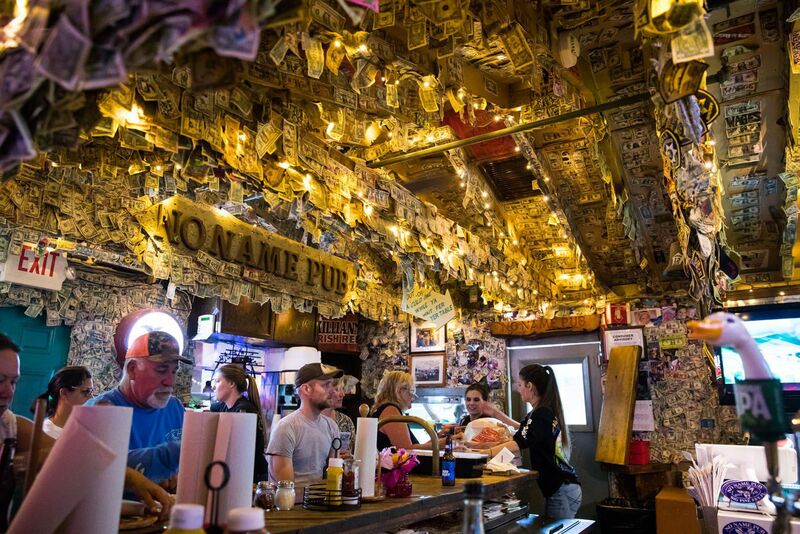 It’s no longer a brothel, but since the 1980’s visitors have been adding their dollar bills to the walls and ceiling of the pub. Now it looks like every square inch of the No Name Pub is covered with the faces of George Washington, with a few bills from other countries thrown into the mix here and there. We have never seen so many dollar bills in one place. On some spots the walls are covered with 40 layers of bills! Just out of curiosity, we asked the staff how many dollar bills they think are stuck to their walls. Their answer: a half million dollars!! That’s a lot of money, but every single bill is written on with permanent ink: names, quotes, dreams, and wishes. It’s controversial if all of these bills are actually worth anything. But what an awesome thing to see. And the nachos are pretty good, too! 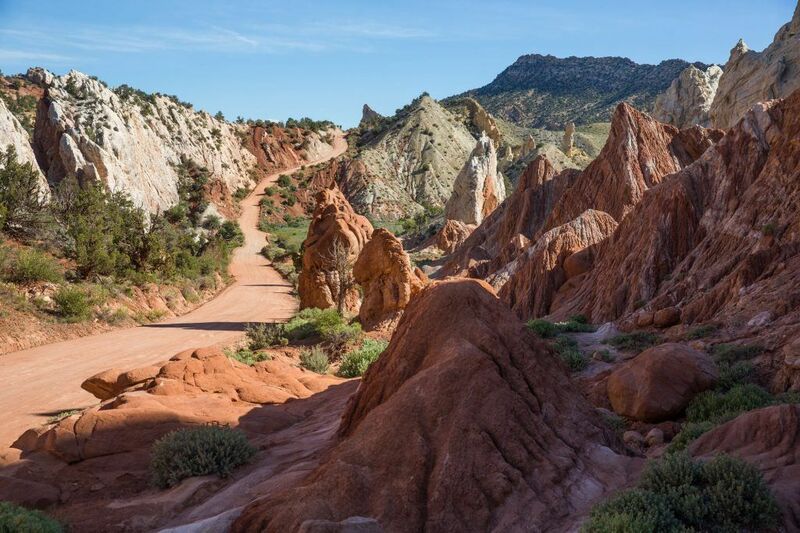 The months between December and May have pleasant temperatures and low rainfall. 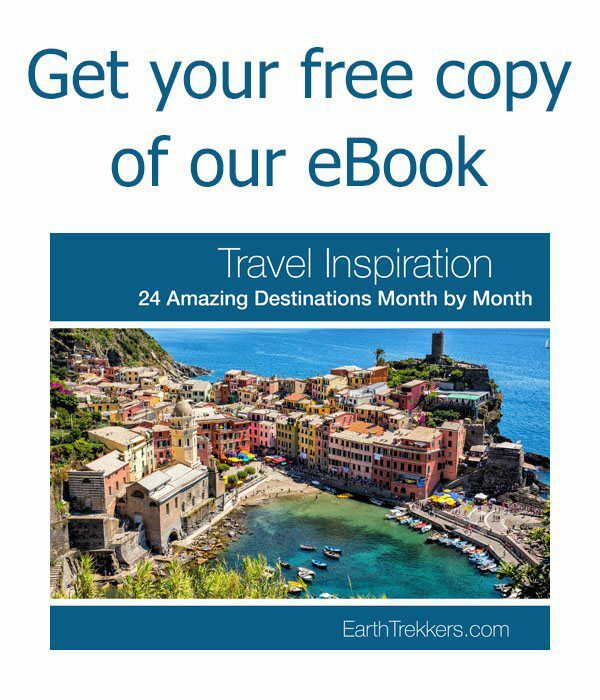 December through February is peak season for visitors, so expect larger crowds and more expensive prices, but you also get the best weather. The summer months, from June through October, are hot, humid, and wet, and you have the chance of a hurricane. We did this in February. Temperatures were in the low 80’s, unusually warm for this time of year, and most days were extremely windy. It was generally dry, with just a brief, occasional rain shower. Tim and I visited Key West for a family wedding. My mother rented a house in Key West for the weekend, and we joined her along with several other family members. Six of us shared an amazing house in downtown Key West that was conveniently located near most of the hot spots. 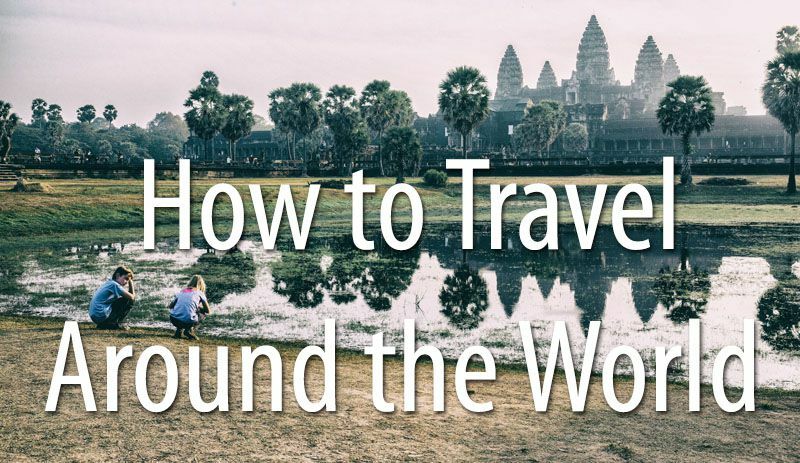 In just 15 minutes, we could walk to the bars on Duval Street, the Southernmost Point, and a handful of great restaurants. The property we stayed in is called Absolutely Paradise and offered through Key West Hideaways. This is a three bedroom, 2.5 bath house with a kitchen, living room, laundry room, and deck with a small swimming pool. It was wonderful and we would definitely stay here again. 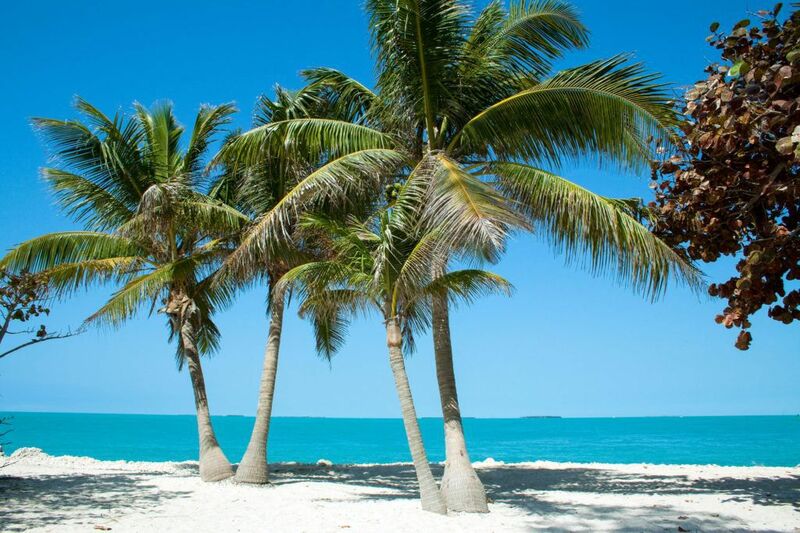 Do you have plans to visit the Florida Keys soon? Comment below if you have any questions! This is in one day on the way to KeyWest? Mahalo! 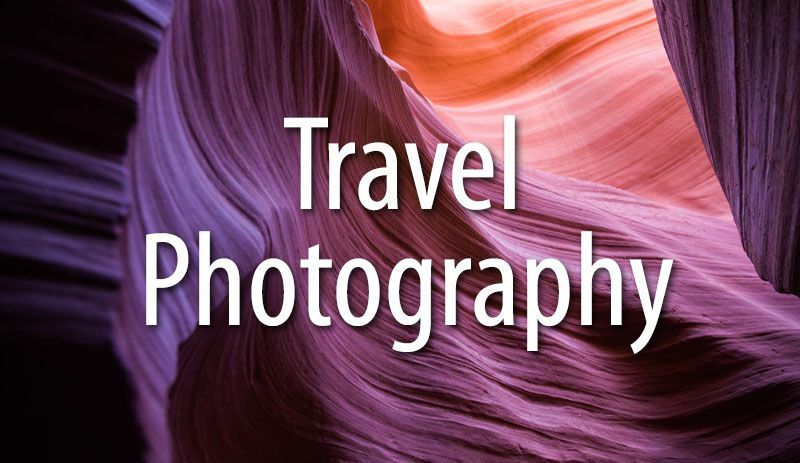 We enjoyed your post very much and I’ve made notes for our trip next year. 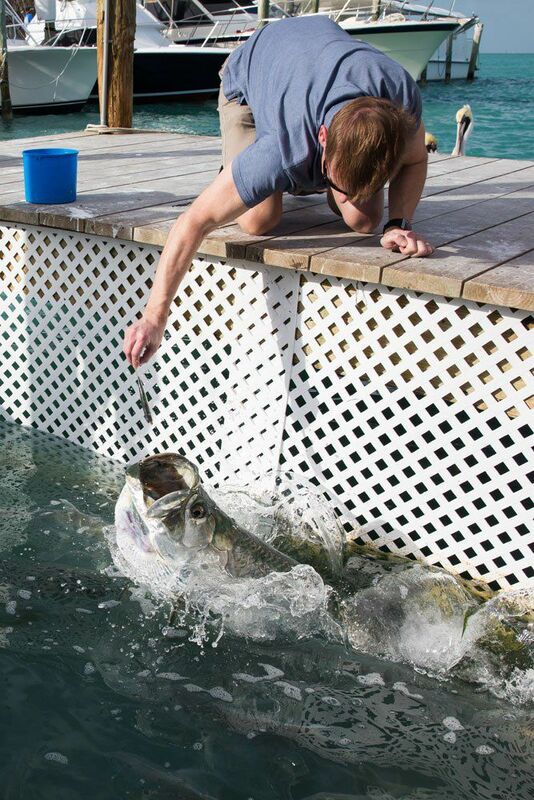 Loved your suggestions.. Did a lot of them but especially feeding the tarpon! Hello Harshita. As for timing, you will need one full day in the Everglades, one full day for Miami, and that leaves you with two full days to drive down to Key West and back again to Miami. 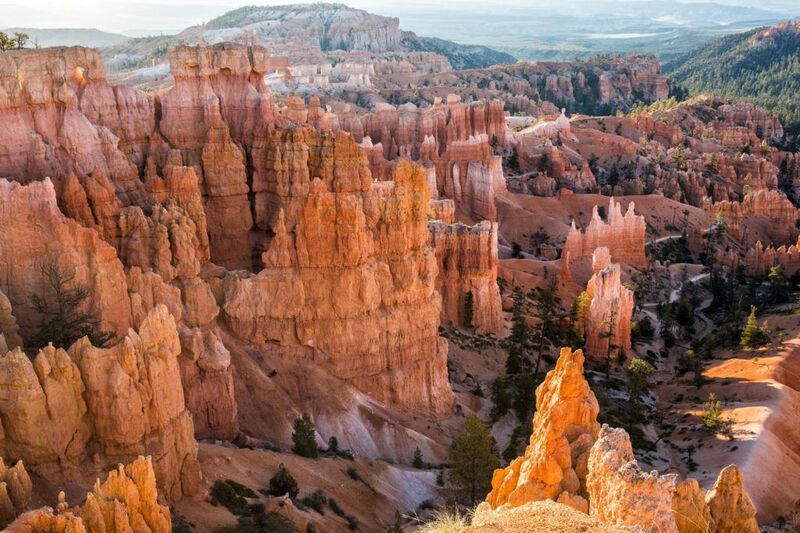 More time for Key West would be ideal but you would have to decide if it’s worth giving up some of your Miami or Everglades time. You could stay in Homestead, like we did, and it will be a whole lot cheaper than staying in Miami. You won’t get the experience of staying in downtown, but you will be close to the Everglades. Key West tends to be a very expensive destination, especially at the time you are visiting. 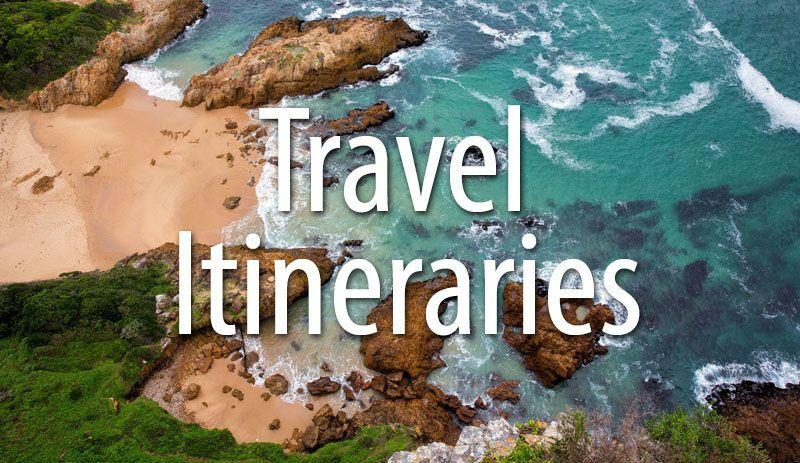 We use Booking.com to find our hotels and apartments so you could start here. Making the drive in november from MIA to EYW…. your tips are incredibly helpful. Thank you very much for the suggestions! I agree with everything except Mrs. Mac’s Kitchen . It more like a fancy Denny’s and one can eat that type of food just about anywhere outside of the Keys. 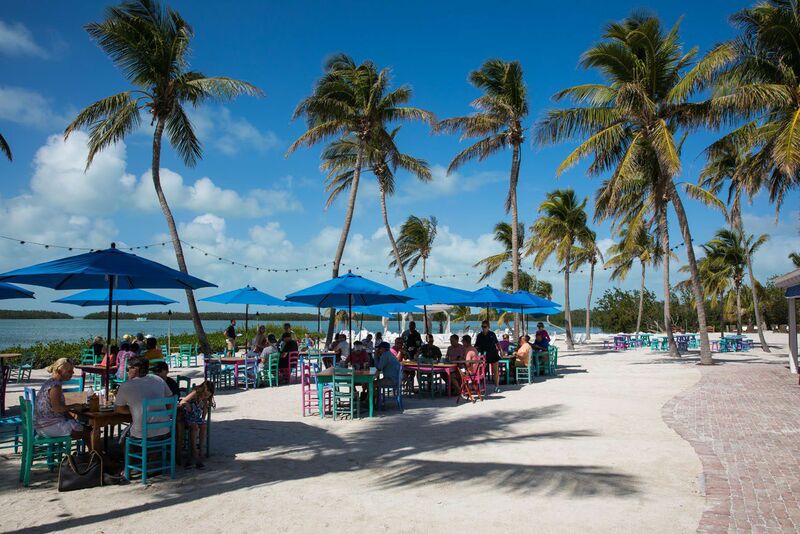 I would choose most any dock or bay side restaurant and some even have an ocean view like Lazy Days in Islamorada. There’s also Black Siren, Snook’s, or Fish House. Surprisingly, World Wide Sportsman’s Islamorada Fish Company is really good and the sunsets are amazing. Morada Bay, Marker 88…. there are many the represent the Keys. The important thing to remember while here is to relax and enjoy our slower paced lifestyle – nothing here comes in a hurry. Also, be safe; wear your life jackets, dive with a buddy, and slow down on the highway. 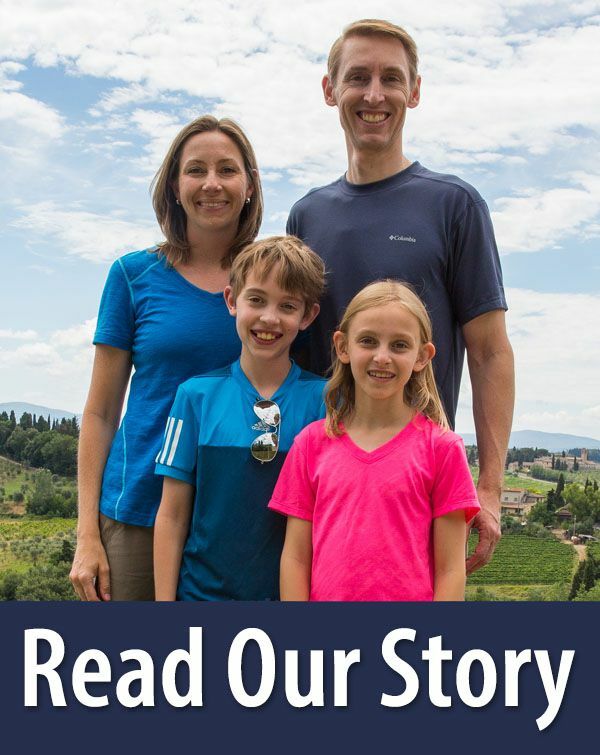 I am fortunate to be able to live here – it’s a wonderful and unique place.